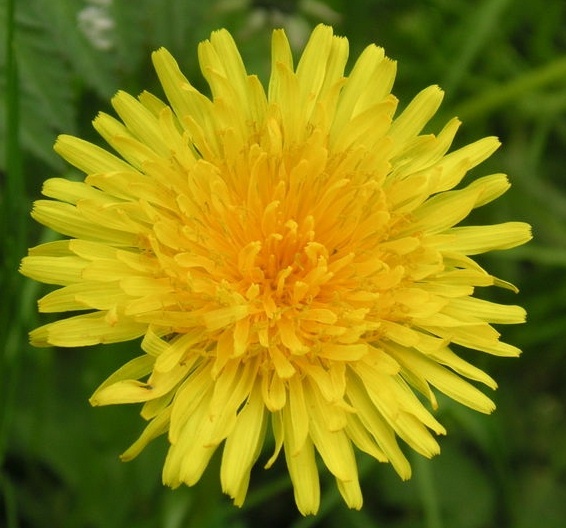 Dandelions greet us in the spring with their showy, bright, yellow flowers. And yet sadly disdained at their arrival by many. Dandelions aren’t neat or controlled. They go where they want, traverse difficult terrain, rooting even between rocks only to breath forth its golden rays of hope and strength.Imagine then encountering the spirit of the dandelion ~ a plant whose roots go deep into the dark of the Earth Mother – familiar with the void and mysteries that abound in the dark. Even her leaves are arrow shaped, her stem hollow, filled with a milky sap holding a top a glorious bloom full of many, many flowers while appearing as one. I love dandy’s tenacity and resilience. Whenever I see Dandelion return in the spring I feel something powerful and primordial charge through my veins. I am empowered. Her flowers are especially abundant in the spring during a time of our own awakening from the dark. She gifts us with herself. Two years ago upon reading a Susun Weed article about making dandelion breast balm from the flowers I decided to engage with the dandelion blossom in this manner. The experience stands out as one of my most empowering and personal daily rituals. I made the balm (I’ll tell you how shortly) and proceeded to apply about a teaspoon or more into the palm of my hand using a wooden applicator (available at most craft stores). At times I lit a candle to enhance the ambience! I stood naked before the mirror in my bathroom. I rubbed this sacred balm between my hands infusing it with my personal intent of empowering and appreciating myself wholly without reservation. My eyes watered and I knew that the dandelion blossom and I were shining as one, rooted in the Earth Mother, stretching and growing in most unlikely places with so much potential not even unleashed yet! I continued to do this ritual for one year. At the end of the year, I was so amazed by the gradual transformation that I felt a desire to share this with other women. Spring is dandelion time! If you want to make your own empowerment balm now is the time to gather her flower petals. First, gather the blossoms on land free of pesticides and away from the toxicities of the roadways. Try to harvest the flowers on a sunny day but before the heat of the day in the afternoon. Pay attention to the flowers that beckon you and leave those that do not. Thank each one and add them to your basket. Then, find a comfortable place, with perhaps a sip of nettle infusion over ice, and begin to pluck the petals out of the calyx (the green cup-like plant part where the ends of all of the petals rest). You are after only the yellow petals. Be aware that your fingers will turn yellow and darken a bit but it doesn’t last! I like to think if it as merging with the blossom. Soon, you will have a bowl of gorgeous yellow fluff! 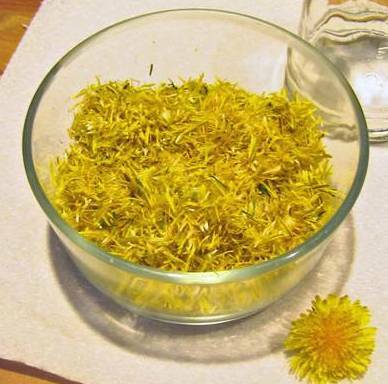 Now, you’re ready to make a dandelion flower oil. Place the dandelion fluff in a glass jar. The size of the jar depends on how much fluff you have. I’ve done both pint and quart jars. You don’t want to stuff the fluff into the jar. Just gently fill the jar to within an inch of the top. Next, you are going to cover the flower petals with oil to the very top of the jar so that you have at least an inch of oil “head space” above the plant material. I use ¾ extra virgin olive oil and ¼ grapeseed oil for this balm. Many other infused oils I use only olive oil. I can’t tell you exactly why I do the combination with the dandelion (an inspiration at the time), but it results in a very pleasant oil and balm. Now, stir the oil-laden petals with a wooden skewer to release air bubbles. You will notice that the petals will soak up the oil. It’s very important to top it all off with at least a half inch of oil. I prefer closer to an inch of oil. You want to avoid having any plant material surfacing the top of the oil. If you do you seriously run the chance of developing mold on top of the jar. I find that if I have this oil “head space” mold doesn’t develop. Loosely secure the lid and place the jar on a plate to catch any seeping oil. Another method that works well is to place cheesecloth over the open jar and secure it with a rubber band. This method allows the air bubbles to escape but protects the oil from any dust particles. Occasionally, I will stir the mixture again, especially during the first two weeks of the process to release any air bubbles. Keep the jar at room temperature – not too hot, not too cold. After four to six weeks, you can strain the golden oil through cheesecloth. Best not to let the infusion set longer than six weeks or you increase your chances of getting mold. You can make your empowerment balm at this point if you want to. If you prefer a later time, I suggest you strain the oil and place the infused oil in the refrigerator. This extends the shelf life. I also learned from one of my teachers, Kathy Eich, that if you add a little jojoba oil to the infused oil it acts as a preservative. On another note, I find it really beneficial to prepare the space for making the dandelion balm in a special, intentional manner. I like to create a little sacred space using a paper or cloth towel as a base on which to set my clean jar for the balm. You will be amazed at what a difference this little act makes! Truly. I do this with all my herb makings. Remember, it’s all about intent and working from your heart. Ok, let’s make the balm. You will be using a double boiler pan set up. If you don’t have one you can generally locate one at a second hand store. It’s basically a set of two pans designed with one to hold the water and the other to nestle inside holding your ingredients. This allows what you’re melting to be heated indirectly. It lessens the chance of burning your blend. One thing, however, you need to be careful with is the level of water in the lower pan. You don’t want it to boil over and splash into the pan holding your oil blend. Oh, and there’s one more thing. Be sure to wipe the bottom of the upper pan with a towel when you remove it from the pan with the water before you transfer it to where you’re pouring the hot melted oil blend. Otherwise, you risk adding water droplets with the oil when you’re pouring it into your jars. Not something you want! First, you want a ratio of 2 parts infused oil to 1 part beeswax. A “part” is defined as whatever measuring tool you use. For example, a “part” may be a tablespoon or and ounce or other measured amount. For a 2 oz jar, you use approximately 2 oz of infused oil to 1 ounce of grated beeswax. I actually prefer this particular balm to be firmer than an ‘ointment”. It lends itself well to using a wooden applicator and the balm “melts” in my hand. Be sure to sterilize the balm jar and dry thoroughly. And don’t forget to label! Even seasoned herbalist find that “unlabeled” item in their pantry and do not know 100 % certain what it is. Really, it does happen. It takes about 20 to 30 minutes to set or a little longer. I store extra jars in the refrigerator. I find this has a very long shelf life – well over a year. Experiences may vary. Primarily, you want to store your balms or ointments in a dark, cool place. I look forward to dandelion’s arrival every year!